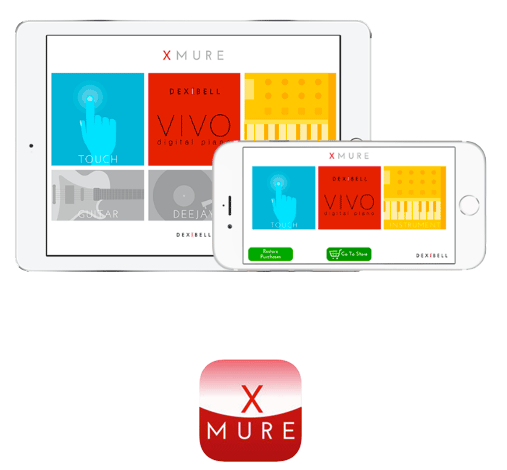 XMURE is a revolution in automatic accompaniment. Simply connect the iPad/iPhone to VIVO and enjoy real audio accompaniment played live. The dream of every musician! XMURE does not use the standard methods of sound generator, virtual instruments or standard MIDI files, our sounds and effects reproduce real audio played live, which renders them ageless. This approach does not simulate reality, it is reality. Arrangers will never be the same again, thanks to our patented, cutting edge technology – Harmony Poly-Fragmentor©, the first algorithm on the planet that can modify audio tracks in real time. Not only does XMURE work seamlessly with your Dexibell VIVO, you are also able to play music directly from the screen of your iPad/iPhone using touch or indeed using any instrument plugged by USB or audio jack. Each accompaniment has been meticulously produced in a studio and incorporates 4 variations. It is then manipulated by our HPF technology to produce an unsurpassed and unique sound quality. New accompaniments are added regularly to the growing library to assure every genre of music is catered for and to accommodate new musical tastes as they hit the charts. XMURE gives superpowers to VIVO. The ‘VIVO Editor’ app allows easy and fast touch screen interaction of all VIVO parameters. The iPad screen can be utilised to quickly select sounds, configure the mixer parameters and set master keyboard zones. At the heart of VIVO lies cutting edge technology which supports sampling and modelling at 24bit / 48KHz. Every parameter of our T2L (True to Life) engine can be modified using the simple and intuitive graphic interface of ‘VIVO Editor’. T2L parameters allow easy creation of personal Reverb settings along with in-depth editing of 14 other 32bit effect types. The T2L modelling parameters of each sound can also be modified using ‘VIVO Editor’ including hammer noise, damper noise, string resonance, key off noise etc. All of these components can be altered to the individual taste of the player. When all components of the sound have been modified successfully, including split sound and volume, and layered sound and volume, it can be saved and named directly to the internal memory of VIVO from the app. This is essential for stage use where you require quick access to performance sounds. 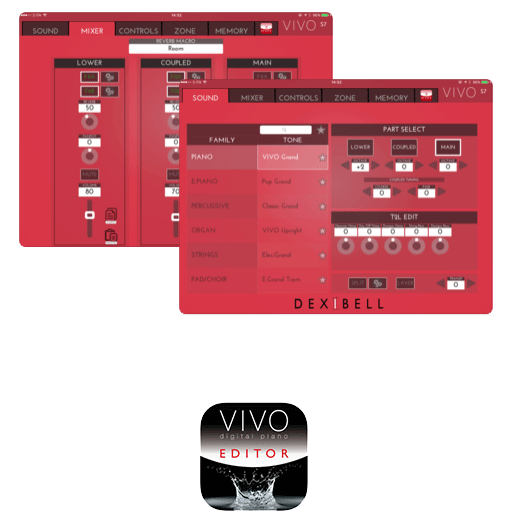 The family of Dexibell Apps is enhanced by the direct interaction of ‘VIVO Editor’ with ‘XMURE’ giving the user unprecedented control. ‘VIVO Editor’ is compatible with VIVO Home (H7, H3 and H1), VIVO Portable (P7, P3) and VIVO Stage (S7, S3, S1, SX7, S9) running firmware 3.0 or higher.